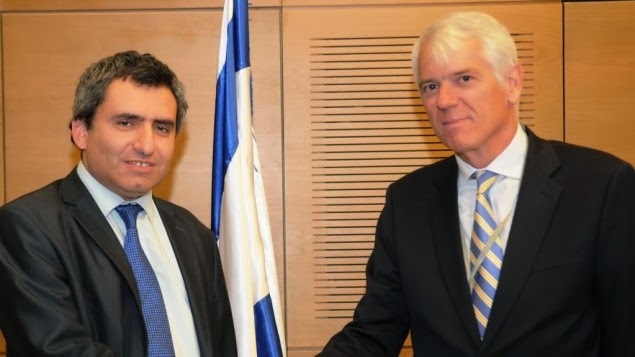 European Union Ambassador to Israel Lars Faaborg-Andersen freely admitted on Wednesday that Europe intends to blame the Jewish state if the current peace talks fail to produce an agreement. "Naturally, the blame will be put squarely on Israel's doorstep," stated Faaborg-Andersen. He qualified that remark by insisting it would be only "logical" to attribute failure to Israel if the issue that prevents the signing of a peace deal is Jewish "settlement activity." The problem with that approach, as many Israeli officials have repeatedly noted, is that many in the Palestinian leadership are just looking for a way to avoid concluding a compromise peace agreement with Israel, and the Jewish settlements are a convenient excuse to do so. Palestinian leader Mahmoud Abbas has given no indication that he is prepared to take seriously Israeli requirements for peace, and Faaborg-Andersen just gave him the "out" he needs to remain intransigent, while being assured Israel will take all the blame. Earlier in the week, Prime Minister Benjamin Netanyahu addressed just this issue during a joint press conference with visiting Canadian Prime Minister Stephen Harper in Jerusalem. Netanyahu reminded those present that "this conflict raged for half a century before there was a single Israeli settlement or Israeli soldier in Judea, Samaria and Gaza." As such, it was wrong to view the presence of Jewish communities as the "core of the conflict," a notion Harper seemed to fully grasp. Faaborg-Andersen also said he (and the rest of Europe) could not understand Netanyahu's insistence that the Palestinians recognize Israel as "the Jewish state." He claimed ignorance as to what the Israeli prime minister means by this demand, but in reality, it's really rather simple. The nations round about Israel are all recognized as Arab states. Turkey is recognized as the Turkish state, just as neighboring Greece is the homeland of the Greeks. While all of those countries have minority populations, they are recognized as the national homeland of their historical landlords and dominant population groups. Israel requests the same. It is also unlikely that Faaborg-Andersen fails to realize that for the Palestinians to officially and publicly recognize the right to exist of the Jewish state (and not just the State of Israel) would truly put an end to the conflict. Perhaps he agrees with their refusal to do so? Meanwhile, Abbas' own Fatah faction recently posted to one of its official Facebook pages a video threatening to bomb Tel Aviv. This represents a gross violation of the peace accords and obstacle to current talks, and yet Faaborg-Andersen didn't seem to have any words of warning or condemnation for the Palestinians. Last week, Netanyahu labeled the European Union as "hypocritical" for constantly condemning Israel for every perceived infraction, while conspicuously failing to criticize even a fraction of the Palestinians' wrong-doings.